Could Your Bridge or Denture Use a Few Implants? Maybe it’s time for a new bridge or denture because your current one has worn down too much to function properly. Or, perhaps, you may want a sturdier, more comfortable, and lifelike option that doesn’t involve hidden clasps, abutment teeth, or adhesives to remain in place. For many patients, traditional bridges and dentures are a viable option for replacing lost teeth. However, they require the unique support that only dental implants can provide to truly mimic the comfort and stability of healthy, natural teeth. By upgrading to an implant-supported prosthesis, you can almost instantly experience the benefits that the biocompatible, root-like posts offer. Dental implants are a natural step in the quest to create highly lifelike replacement teeth. With the addition of replacements for lost teeth roots, modern prostheses can more accurately restore the functions of lost natural teeth. The posts, which are crafted from biocompatible titanium, are designed for your jawbone to heal to their surfaces. This creates an anchor within your jawbone, similar to a natural tooth root, that your dentist can utilize to secure your custom-designed prosthesis. One of the more immediate benefits of upgrading to implants is the enhanced stability that the anchored prosthesis offers. Yet, that’s only the beginning of the benefits they offer. Besides supporting your healthy, natural teeth, roots also serve the function of stimulating your jawbone every time you bite and chew. This stimulation is vital for telling your body how many minerals and nutrients to send your jawbone. When you lose teeth roots, this stimulation diminishes, and your body responds accordingly by limiting nutrients to the jawbone. 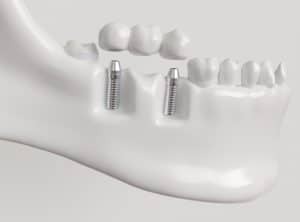 Implants restore this stimulation to preserve your jawbone’s healthy supply of nutrients, which helps prevent the jawbone erosion that often follows tooth loss even after the placement of a traditional bridge or denture. The good thing about replacing lost teeth with dental implants is that they’re suitable for most tooth loss patients. However, your candidacy for dental implants may be affected by things like the presence of an oral health issues, such as gum disease, or the significant erosion and weakening of your jawbone. Before suggesting implants, your dentist will carefully examine your teeth, gums, and oral tissues to ensure that no issues are present. Then, your dentist can work closely with you to plan your dental implant placement and restoration. The closer your dental prosthesis resembles your healthy, natural teeth, the more effectively it can restore and preserve your smile for life. To learn more about supporting your bridge or denture on dental implants, schedule a consultation by calling Syosset Dental in Syosset, NY today at 516-433-2211 or 516-921-6930.